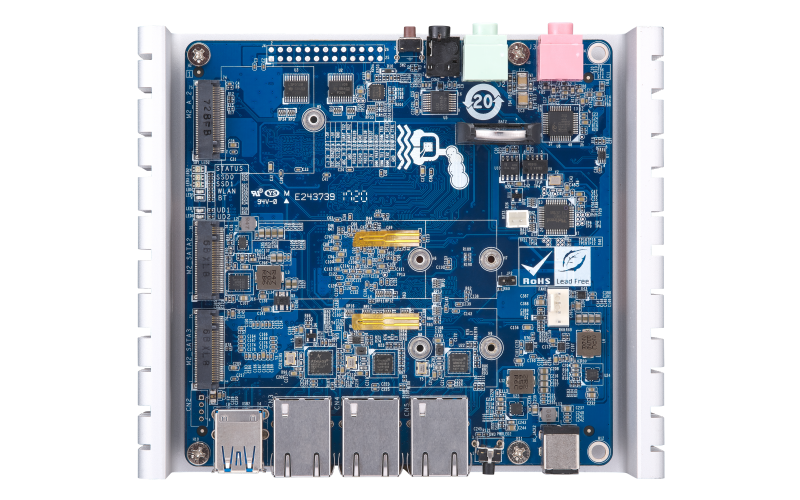 The QBoat Sunny is the first single-board IoT mini server by QNAP. Measuring only 12cm x 12cm (without heatsink), the development board-like design can be effortlessly installed for almost any type of IoT application, while providing several interfaces for connecting to development boards and devices. Rule engine criteria and subsequent actions can be processed locally for you to create a small-scale/private IoT application with minimal costs. The QBoat Sunny can also reduce bandwidth and cloud processing costs of large scale/public IoT solutions by using it as a fog computing server/gateway to filter and relay data to public clouds. Note: The cache size depends on the total memory. 4. Bad block scan and hard drive S.M.A.R.T. 5. Importable SSL certiﬁcates 6. Instant alert via E-mail, SMS, beep,and push service 7. 2-step veriﬁcation Note: Data encryption functions may be unavailable in accordance with the legislative restrictions of some countries. 2. Monitor the resource usage of NAS applications. 2. Create IoT Application with Multiple Things, Single Rule and Single Dashboard with Things Management, Thing Type Management, etc. 3. QIoT Device gateway supporting protocols such as MQTT/MQTTS, HTTP/HTTPS/ CoAP. 4. QIoT Rule engine based on Node-Red with custom QIoT Nodes. 1. Turn USB Camera into IP Camera. 2. Support UVC (USB video device class) USB Camera. 4. Support RTSP Url for getting the live stream of camera. 1. Supports mounting a Cloud Drive (such as Google Drive, Dropbox, Microsoft OneDrive, Amazon Cloud Drive, Yandex Disk and Box). 1. VPN Server: Secure remote access with PPTP、L2TP/IPSec & OpenVPN VPN services. Download the QNAP QBoat Sunny Datasheet (PDF).